"How did Bilaam start the letter he gave to the messengers?" "Dear Balak..."
For those who aren't familiar with the term, dir balak דיר באלכ is an Arabic phrase meaning "pay attention", and is often used in Hebrew in the sense of "Watch your back! Pay attention (that this doesn't happen)!" dira דירה - house, originally "buildings surrounding a court"
kadur כדור - ball. Klein writes that some experts "explain the word is formed from prefix כ (= as) and דור (= circle)." "Upon hearing that, the king was very disturbed, and he set his heart upon saving Daniel, and until the sun set made every effort to rescue him" (JPS translation). Now the word bal בל appears only here in the entire Tanach. Rashi admits that he does not know what it means, but can figure it out from context. However, the commentators who lived in Arabic speaking countries (Rav Saadia Gaon, Ibn Ezra) were familiar with the word, and noted that the Aramaic bal has an Arabic cognate meaning "thought", and so the phrase means "to pay attention". There is a similar phrase in Hebrew - sim lev שים לב, also meaning "pay attention", literally "set his heart". 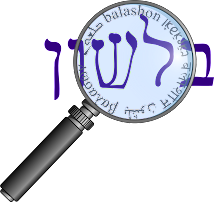 The similarity between the Aramaic bal and the Hebrew lev led some commentators (Radak, Ralbag) to conclude that the two words are related - just the letters switched places. 2 in verbal and quasi-verbal expression: be mindful of BA, Jud, Man. --(a) w. סים, יהב: to pay attention BA, Jud. --(b) יהב בל מן: beware of Jud. --(c) plus pron. suffixes: pay attention! Man. LSp 80, s.v. \f7yhb\f1, mng. 3. So if anyone can help out with any of this, particularly access to the Tarbiz article or the Lieberman book, I'd be grateful. I was going to write a post about the city of Gaza עזה, if it was related to the word עוז oz - strength, and the theory that the material "gauze" gets its name from Gaza. But it turns out that Lameen Souag already wrote the complete post. It's a good thing that I live in the age of computers. Had I tried writing this stuff in a time where I would need to write by hand - no one would have been able to decipher my handwriting. Usually, my unclear handwriting is only a problem to a small group of people who need to suffer it. But in the past, when everything was handwritten, the impact of an unclear letter could be very significant in determining the meaning of a word. And occasionally, a misspelling could alter the word itself. That's what we find with the word listim ליסטים (or לסטים). In Talmudic Hebrew we find the word meaning "robber, bandit". According to Avshalom Kor (Yofi Shel Ivrit, ch 32), the word originally was ליסטיס leisteis - from the Greek leistes or lestes meaning "robber". Ornitholestes - a dinosaur, meaning "bird robber"
Over time, the final samech of ליסטיס was incorrectly identified as a final mem, and the word began to be spelled ליסטים. I should point out that Steinsaltz writes that listim was an abbreviated form of listesim ליסטסים. However, Kor's view seems to be more widely accepted, and he brings other examples of samech / final mem mix-ups. It seems that from here, listim came to be identified as a plural due to the -im ending. While I couldn't find an example of a person being referred to as a listi לסטי (as in Ben-Yehuda's dictionary), we do find cases where listim meant plural. Perhaps the most famous was quoted in Rashi's commentary on the first verse of the Torah - לסטים אתם - "You are robbers!". When you put Listerine in your mouth, it hurts. Germs do not go quietly! Sometimes how you define a word actually "defines" you as well. For example, let's take the Hebrew words nesher נשר and ayit עיט. From an informal survey I have taken, most native English speakers (who know Hebrew) will identify the nesher with the eagle, and if they have an answer - the ayit with the vulture. The Israelis would usually say that #1 is an ayit, and #2 is a nesher. Typically, the modern commentaries reflect this division. The JPS translates nesher as eagle, for example in Shemot 19:4, where the translation "on eagles' wings" sounds much more natural than "on vultures' wings" (82,000 hits on Google for the former vs. 7 for the latter.) On the other hand, the Daat Mikra almost always identifies the nesher with the Griffon Vulture. The dictionaries also know their audience. The Even-Shoshan Dictionary (Hebrew-Hebrew) has the Griffon Vulture as the primary definition for nesher, with eagle as only a secondary option. Even-Shoshan also has eagle for ayit. The Alcalay Dictionary (Hebrew-English) has exactly the opposite order. But of course, there are always those people who take it upon themselves to correct popular usage and put the masses on the proper path. And here we find two articles - each trying to convince the reader that they should change their initial association. First we find an article by Rabbi Nosson Slifkin - no stranger to controversy. In his article, The Identity of the Nesher, he tells an English speaking audience why they should think of vultures, not eagles, when they say nesher. Even the bald eagle is not actually bald; it merely has white feathers on its head (its name comes from the Old English word balde, which means “white”). Besides, it only lives in America, and Scripture would therefore not discuss it. On the other hand, we have an article by one of Israel's premier linguists, Ze'ev Ben-Hayyim. Ben-Hayyim was one of the founders of the Academy of the Hebrew Language, and its president. In his book, B'Milchamta Shel Lashon (The Struggle for a Language) he has two pieces about nesher and ayit (both originally published in the journal Leshonenu). He writes (in 1943) that every "Ivri" knows that nesher is eagle and ayit is vulture. But then came those who turned everything upside-down and began teaching the opposite. He says it is clear that when we refer to the Rambam as "HaNesher HaGadol" הנשר הגדול - we are talking about a symbol of royalty, just as the Romans had an eagle for their royal symbol. So where did this "mistaken" view originate? According to Ben-Hayyim, from two faulty etymologies. On the one hand, there were those who thought the word nesher derives from the root נשר - "to fall out, to drop, to shed". This would seem to be appropriate for the vulture, who, as we saw above, has more of a bald head - one whose feathers "fell out". But this does not work out when we realize, as Horowitz writes, that shin is "a double letter". Nesher (the bird) in Arabic and Aramaic becomes nesr and nishra נשרא respectively, but the verb "to fall out" is נתר (with a tav) in Arabic and Aramaic. So where do we go from here? Let's start by looking at the word ayit. All seem to agree that it derives from the root עיט or עוט meaning "to rush down, to dart" - the description of a bird of prey. We see this description in Bereshit 15:11, where it says that the ayit descended on the carcasses. - וַיֵּרֶד הָעַיִט, עַל-הַפְּגָרִים. Both in Biblical usage and modern scientific parlance, nesher is appropriately associated with the griffon vulture; whereas ayit refers to the eagle. The possible exception to this in Tanach is Yechezkel's depiction of Melech Bavel in Perek 17; as noted by Yehudah Feliks, the depiction of this particular nesher as "full of feathers" suggests an eagle rather than a vulture. Indeed, even the Daat Mikra (on Yechezkel 17:3) agrees that this verse is likely referring to an eagle. But if we go by the rule that "The Torah speaks in the language of man" (Berachot 31b), then the word nesher in that context must have made sense to the reader. And so, it would seem that nesher as well, refers to a larger group of birds, including both vultures and eagles. This is the explanation of the Encyclopedia Mikrait as well, who writes that the Arabic term nesr also does not refer to only one species, but to both eagles and vultures (in contrast with Slifkin above.) The EM also says that while most examples of nesher refer to vultures, Mishlei 23:5 is likely referring to the Imperial Eagle, and Shemot 19:4 to the Golden Eagle. So I think that in the end, both native English speakers and native Hebrew speakers can go on referring to the nesher and ayit the way they always did, but hopefully with a great deal of understanding of the other side. "No... 'Achbar' [with the 'ch sound scraped deep in the back of his throat] meant mouse. Akbar [with the 'k' sound coming percussively from the roof of his mouth] , was... something completely different." I had enjoyed the story, but hadn't given much thought to the linguistic side of it, until last Friday. In our local library, I found a very important entry in the Encyclopedia Mikrait (Biblical Encyclopedia) called Milim Zarot (Foreign Words in the Bible) by the important Israeli linguist Chaim Rabin. The article mentions dozens of words that may have entered the Bible from neighboring languages, and as you can expect, it has provided me with many ideas for future posts. While I was familiar with words of Akkadian, Egyptian and even Greek origins, I didn't realize that there were Biblical words that derived from Arabic (actually proto-Arabic or Ancient North Arabian). One of the Hebrew words that Rabin suggests comes from Arabic is none other than עכבר achbar, mouse! He writes that it probably meant "great / big one", in a euphemistic way. It would then very much be related to the Arabic akbar, which is אכבר in Hebrew, from the root כבר - "great". He writes that in certain Arabic dialects in the region it was common to switch between alef and ayin. From the root כבר we get a number of other words, including the adjective kabir כביר - "great" and perhaps the Greek gods - the Cabeiri. According to some scholars כבר ( "to be great") is identical with כבר ( "to sift"), the sense development of this base having been "to interturn, twist, make strong". They compare the bases גדל ( "to be great") and גדל ( "to twist, to plait") which seem to have undergone a similar sense development. In regards to kivra כברה, Ben-Yehuda does mention the approach that it is related to kabir, but primarily goes along with most other scholars that I read who claim that the kaf in kivra is not radical, and the root of the word should be seen as ברה or ברת.